SmartKey Locker systems are the ideal solution for securing, controlling and tracking larger objects. SmartKey Locker systems are the ideal solution for securing, controlling and tracking larger objects. 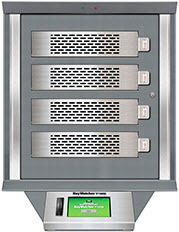 Featuring an intuitive touchscreen interface and enhanced access control integration capabilities, SmartKey Lockers let users manage laptop computers, cash trays and other restricted items efficiently and securely. Lockers can be set up as a personal storage space for one or multiple users, and like all Morse Watchmans solutions, they are customizable and scalable. It’s just one more way Morse Watchmans continues to use outside-the-box thinking – right inside the box. Like all Morse Watchmans asset control solutions, SmartKey Locker systems are engineered for complete interactivity with your other business systems. By designing the KeyWatcher Touch to be integration friendly, Morse Watchmans makes it possible to integrate our system with a wide range of access control systems and other products. For example, by integrating your SmartKey Locker system with your access control system, your access control system will know which users are in the facility and which are not. 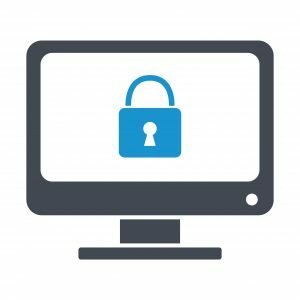 A user who has taken an object from a SmartKey Locker can be denied egress from the facility until the object is returned – and selected management can be alerted automatically via email or text message if an item has not been returned. By designing SmartKey Locker systems with the ability to communicate across systems, Morse Watchmans helps our customers maintain best-in-breed security solutions without the need to overhaul or replace costly installations. 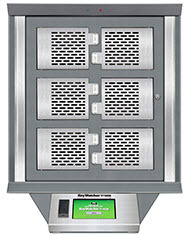 SmartKey Locker systems have a built in Ethernet port for network connectivity. It’s easy to expand scalable SmartKey Locker systems as your needs grow. Start with a single cabinet, or configure your system with multiple cabinets. Designed with scalability in mind, each additional unit can be controlled by a single console and monitored by the advanced TrueTouch software. From a single key management system to multiple key control cabinets holding hundreds of keys, it’s easy to expand KeyWatcher as your needs grow. Each additional unit can be controlled by a single console and monitored by the advanced KeyPro software. The KeyWatcher key box cabinet can hold keys of almost any size, including Folger Adam keys. 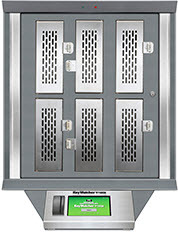 Plus, the systems are capable of incorporating additional lockers for valuable items. 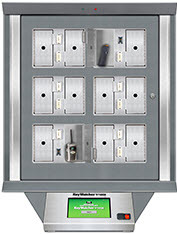 Available modules include 16-key, 8-key, 6-key, card, and a variety of locker sizes. These key modules can be customized in a wide range of cabinet sizes. KeyWatcher TrueTouch key inventory software comprises the KeyWatcher TrueTouch client interface and the KeyWatcher Server for enhanced administration and control of the KeyWatcher Touch system. KeyWatcher TrueTouch client interface is designed to run all programming, remote functions and reports for up to 10 KeyWatcher Touch locations. Add users from a global list and all specific settings (added or modified) will be automatically synchronized across the system. Quick profiles can be assigned for improved user control. Administrative access levels are designed to allow reports only or alarms only in addition to the five system administration levels. Generate TrueTouch reports in landscape or portrait format with color interspaced lines for easy reading. Reports can be scheduled to automatically email, print or save. The KeyWatcher TrueTouch Server is designed for installation on a dedicated computer and can be connected to a KeyWatcher via a network connection or a USB. The server is the main interface for the client software and performs all synchronizations of transactions as well as maintaining the SQL database. Both access control systems and customized client control software interface with the server application. It’s all done with the express intent of addressing your specific security needs with the most cost-effective, end-to-end solutions. Contact Morse Watchmans today and find the solution to all your security management needs. Auto-sync for automatic updates of KeyWatcher systems as changes are made. New “Profiles” feature for quicker, easier programming of users. Profiles to quickly assign users key and group permissions, access level, and many other settings. New, easier to read reports utilize color and include more information. Morse Watchmans’ SmartKey Locker Touch integrates with C•CURE 9000 Software to help users manage personnel, credentials and assets more effectively and efficiently. Whether working from the C•CURE 9000 Administration Station or the SmartKey Locker Touch, administrators can streamline the process of securing, controlling and monitoring keys and other assets for their facility. Integrate now to help deepen your security infrastructure while reducing costs at your site. SmartKey Locker Touch supports integration with Honeywell Pro-Watch security management suite. With this integration, administrators can simplify management of access privileges, user data and events using a single point of control for both systems. Morse Watchmans’ SmartKey Locker Touch now integrates with AMAG’s Symmetry Security Management Software, streamlining security and eliminating the need to program SmartKey Locker Touch users who are already in the Symmetry system.